When Apple and U2 Dropped A Free iBomb. A few weeks ago I returned home to find a free copy of The Sun had been pushed through our letter box. I hate The Sun. It was the metaphorical equivalent of someone dropping a dog turd on our front door mat. A tabloid rag that I wouldn’t even use as toilet paper as I’d wipe more on than take off. I wouldn’t even burn it for fear of completely dissolving the ozone layer. I hate The Sun. Now, replace “door mat” with “iTunes account” and “The Sun” with “new U2 album”. Does this sound at all familiar? Okay, yes, I am a U2 fan. I own all their albums, seen them on tour twice. They are my band. The Edge is my guitar hero. I’m not here to try to convince you to change your allegiances to the U2 camp. It’s a personal thing, everyone has different tastes, and every U2 fan knows that there are people out there who don’t like U2. Heck, U2 know people don’t like U2! Friends of mine have made it very clear to me that they hate U2. Reasons are numerous; they’re dull, boring, past their sell-by date, irrelevant. Most of it tends to revolve around lead singer Bono, who’s apparent Messiah complex makes people want to slap him repeatedly round the face with a trout. They bemoan The Edge’s overuse of guitar effects. That drummer Larry Mullen Jnr. is…short (? ), that bassist Adam Clayton has the hairstyle of a weeble, Everyone has an opinion on U2, and that’s the point. When Apple dropped the new album Songs Of Innocence in over 500 million iTunes accounts in 119 countries, for free, the internet went in to meltdown. The technology giants were able to ride on the back of a buzz the size of which had not been seen in years, just in time for the launch of their new iPhone 6. U2 are probably the only act on the planet that can generate that size of interest I talked this over with my wife, trying to think of other acts that could pull off a stunt like this, and the only other one we could think of was Coldplay – a four piece pseudo-rock band with an annoying lead singer and a penchant for stadium filling anthems. So diluted U2 then! September 9th 2014 has gone down in music history, for different reasons depending on your musical persuasion. 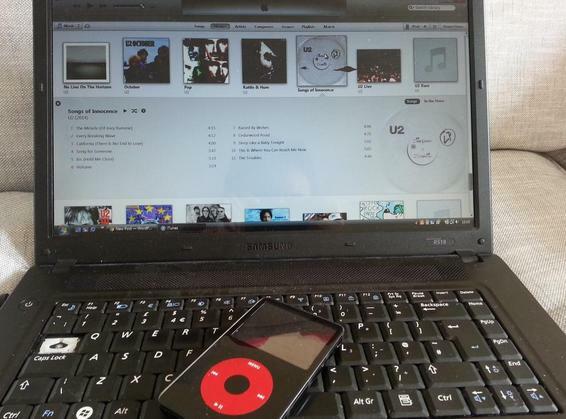 For U2 fans already with iTunes accounts, it was a Beautiful Day (B’dum-TSH!!) – a free U2 album a full month before general release. For fans without accounts, the perfect reason to get quickly online, sign up and grab a copy. For non-fans, a choice; give it a try, or delete it. Here’s where we need some figures. As of 22:00 on Sunday 14th September, U2 have 8 of their albums in the iTunes top 40 chart, with 26 in total immediately searched for and downloaded on the day the new album was launched. Whether these were existing fans broadening their collection or non fans intrigued by the new album or the bands back catalogue, we’ll probably never know. As I mentioned there are those who don’t want the new U2 album, and social media has been awash with accusations against U2 and Apple of intrusion and violation. They feel like “a vegetarian being force-fed a burger”. Like “waking up with a large spoonful of Marmite in their mouth”.they want no trace of anything even remotely to do with U2, and demand to know how they can delete it. Now I wonder how many people went on to their iTunes account, desperate to remove Songs Of Innocence through changing some settings, and then caught sight of something else on the iStore? Perhaps another album, a single, a TV show episode, a film that looked good? How many people just logged on to iTunes, deleted the album, and logged off again? This was about traffic, internet site usage – getting people back on and remembering iTunes. The tactic from Apple is nothing new, and one that many big name corporations use. Take telecommunication companies as an example. You’re paying for a subscription TV service, and a vague letter appears advising you the prices is going up. Maybe you call them to check, or because you’re annoyed. How dare they raise the price. This is where the trap is sprung. You called them, they explain the price increase in more detail. They review the service you have with them, maybe you’re “not on the best package for you”. You didn’t know you could get this, or this. Maybe they offer you a cheaper cost for staying with them for another year. Even if you just call, get the facts and hang up, you called them. You;re aware of them. They’re in your head. 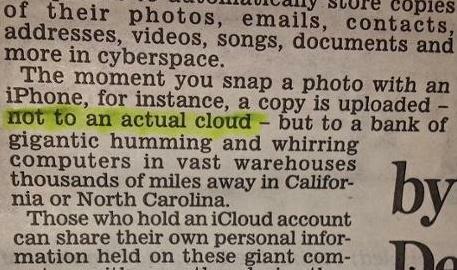 Genuine quote from Daily Mail about iCloud. This is exactly what Apple have done, only they’ve taken it one step further. Musical acts releasing acts exclusively through iTunes is nothing new. Both David Bowie and Beyonce’ used the service as a launch pad for their most recent material, but you had to not only pay, but also search for them. With U2 that option was removed, and that’s the issue. There was no choice. Songs Of Innocence was there in your library without your consent, just waiting for you to download from the iCloud – a brave move considering the service had already generated headlines through the recent Celebrity Photo Hacking scandal, That iCloud (which hysterically the techno boffins at the Daily Mail were at pains to make clear is not a real cloud!) is not the most trusted piece of technology right now. You have to wonder, did something else happen when the iCloud dropped the U2 bomb? I’ve seen tweets not just complaining about the appearance of U2 but also the disappearance of all of their contacts off their phone. U2’s lead singer wrote a very self-aware open letter on the bands website, describing the DNA of the band as “the desire to get our music to as many people as possible”. ITunes was the perfect tool to that end, but the music is just a side-effect. Good as the new album is (and yes, personal opinion here. But it’s a hell of a lot better than their last effort!) it is a by-product of this whole saga, The band have reached more people than any other act in history, whether people listen or not, and given most albums are effectively adverts for inevitable tours these days, the seed for record breaking concert sales has already been set. For Apple, they got under your skin. Aside from the iTunes store, you might not want an iPhone 6, or an iWatch (??? ), but you know they exist. That seed has been planted as well. To paraphrase Admiral Ackbar; “IT WAS A TRAP”, and it worked. The only way to not fall prey to it was to not open, or even have an iTunes account! Bono sings at the end of the new song Miracle (Of Joey Ramone), “Your voices will be heard”. Your voices were heard, predicted, and reacted to before you even shouted. It now just remains to be seen if other acts try a similar method of reaching a new audience with their next release. Will the Rolling Stones try something similar? Will Nickleback do an exclusive free download of their next album and then arrive at your house to play it live in your front room?